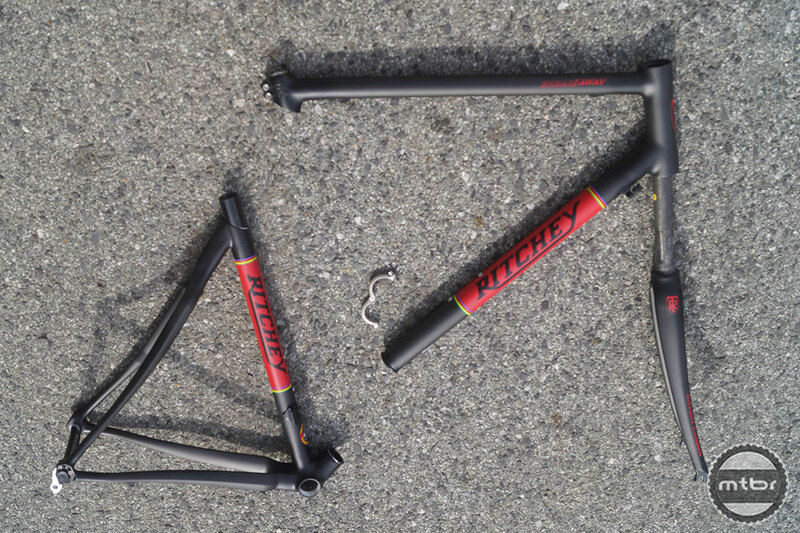 The new Ritchey Break-Away Carbon is made to be broken…apart. And then reassembled. Our reveal of new Ritchey product continues today as the North American Handmade Bicycle Show (NAHBS) kicks off in Charlotte, N.C. this morning. As we mentioned in an article yesterday, we spied some new Ritchey bikes when we stopped by their offices last week—they let us take photographs, but made us promise not to post them until today. Here’s the last of three new Ritcheys debuting at NAHBS. 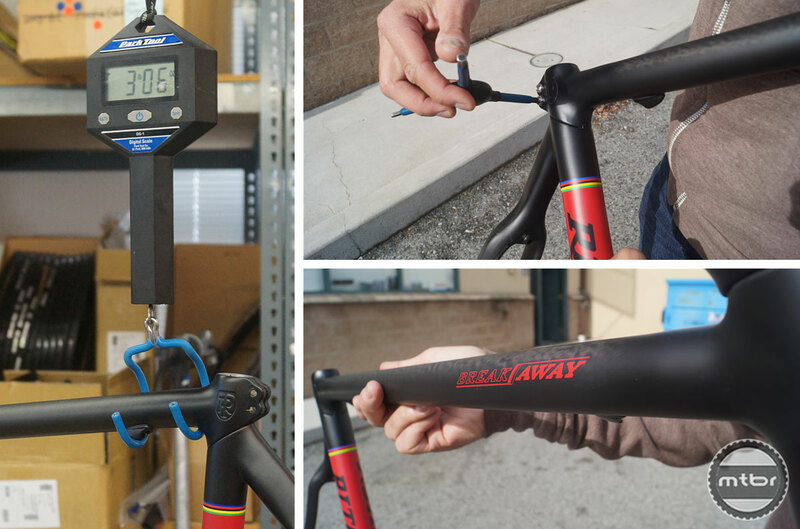 Marketing Manager Angelo DiGiovine shows us the new Ritchey Break-Away carbon near the company’s clandestine R&D facility. Ritchey has been building their fine, standard-luggage-checkable Break-Away travel bikes in steel and titanium for years, much to the delight of the frequent flying cycling public. This year company adds a three-pound carbon frame option, debuting the hand-built original prototype at NAHBS this weekend. Ritchey uses just three allen bolts to make the bike do its magic—two at the seat tube collar and one on the downtube in conjunction with their Break-Away Downtube Hinge Clamp. The frame is constructed of carbon with aluminum reinforcing lugs at the assembly junctions. A handy keyed tab under the top tube (top right) makes alignment fool-proof. The frame shown here is actually a factory-built pre-production sample. 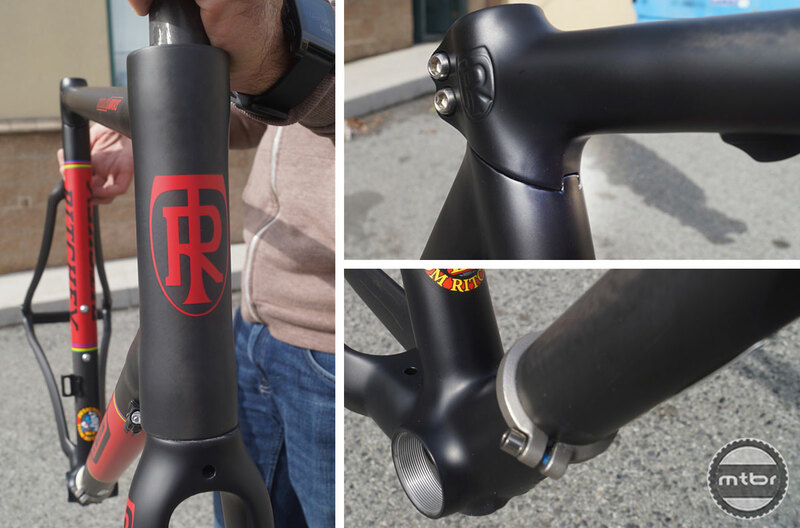 When we visited Ritchey’s office, the handmade, tube-to-tube carbon constructed prototype was out for a ride. 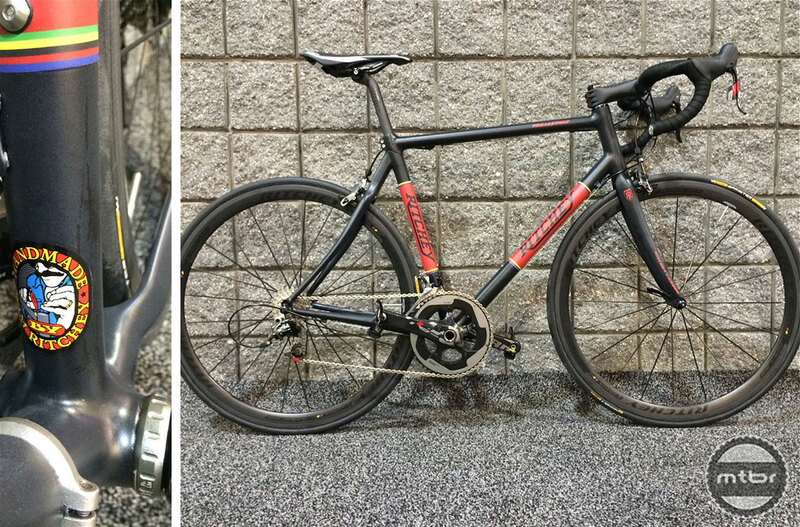 Ritchey just sent us a photo (below) of the original from the show floor. As you can see, the factory-built version is faithful to the original. 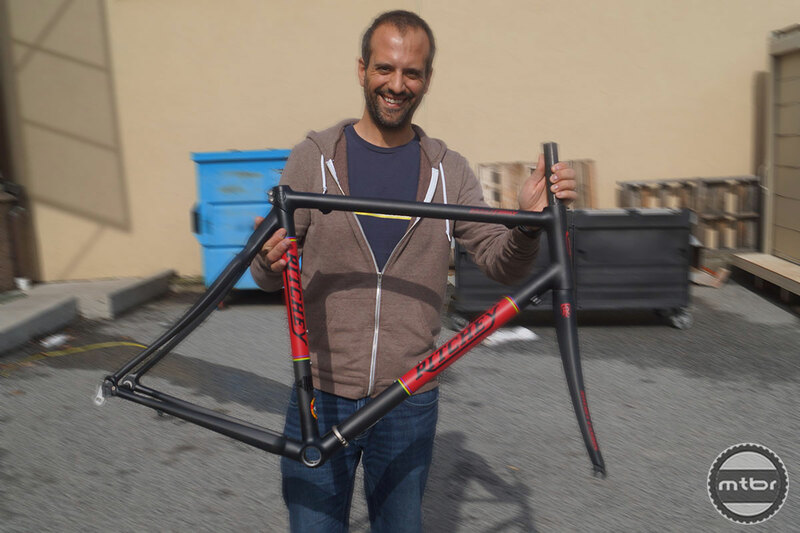 The frame has an MSRP of $3,200 and includes a fork, headset and Break-Away Travel Case. Ritchey is targeting an August ship date. You can check out the other frames launched at the show here—the Ritchey Swiss Cross Disc, and the Ritchey Commando fatbike. So wouldn’t that still be a major pain to deal with? I don’t see how you’re going to get around dealing with brake/shifter cables every time you transport it. Besides fitting in a smaller box I’m not sure how this helps. Unless I’m totally missing something. The Ritchey breakaway comes with ‘cable splitters’ that allow you to quickly disconnect the brake and shift cables. Packing my breakaway takes 20 minutes and unpacking takes 15 minutes. I don’t know that I’d feel great about a carbon travel bike. I’ve seen what baggage handlers do to my breakaway and I’m glad that it’s made out of steel. I do wish that they’d offer the steel breakaway with this paint scheme though! I have had the Ti Break Away for … oh…going on five years now. I have traveled with it so much that I am on my second Ritchey travel case! It goes together in less than 20 minutes…and comes apart even faster. The cables are not even an issue with the way they are designed to come apart in the middle of the cable with male/female threads. The carbon looks beautiful but one reason I went with the Ti is for it’s ability to withstand abuse from the airlines. I would be a little concerned with sidewall dings from baggage handling. The point is you’re traveling for a trip to a vacation destination or competition. It’s assumed you would take your bike with you, and a few small hand tools. Only takes an hour tops to get your bike back together, tuned and ready to ride for your competition or long stay at your vacation destination. I guess if this is something you wand to keep in the trunk of your car for a quick ride, that might be a different story. $3,200 for a frame! That’s like 3 very cool complete bikes. Parts of the industry has gone nuts with pricing. The only reason we would pay these prices is if we see bikes as jewelry. Its great to be an enthusiast, biking is a thoroughly captivating and interesting sport. However, the manufacturers are tapping into realms of exclusivity and vanity that have no direct link to turning cranks. Has anyone noticed that in so far as road bikes are concerned that so called innovation isn’t making anyone faster, its mostly hype, fluff and pretty decals resulting in soulless objects with very nearly zero added utility. Travel bikes utilize cable splitters that enable a bike like this to be out of the box and rolling in 20 minutes or less. At worst the rear derailleur cable could require a turn of the barrel adjuster. Steve, I think they use special cable-connectors, so you can just unhook them in the middle. Steve, the brake/shifter cables have couplers that allows them to “break” in the middle and then re-attach. Being able to break the bike in half and putting it into a smaller box means a person can eliminate the charge that airlines exact upon travelers who want to take their bike with them. The charge depending on the airline can range from $100 one way to $300 round trip for a full sized bike box. In reference to cables, there are connectors that can go on the shifter brake cables to “break” them apart as well. I’ve travelled extensively w/ an S&S coupled bike for nearly 10 years and have learned their pros & cons. Break down bikes have limited benefit for domestic travel, because cheap domestic shipping options for “full size” bike cases negate most of the benefits. I can ship a 65+ pound bike box loaded to the gills 1500 miles to my destination for $60 via FedEx Ground. Its waiting for me at my hotel or friend’s house, and I don’t need to drag it through airports, mass transit, etc. Why bother with the cost and additional packing hassle of a break down bike and small case, especially when many airlines will charge you $25-50 for ANY bag. International travel is where break down bikes are invaluable. Bike transport is at least $200 each way international; if your trip has many legs, it adds up fast. On a recent trip to Peru, I avoided $600 of surcharges by using a break down bike that fits in 26x26x10 case. It was also FAR easier toting around mass transit and cabs in foreign cities. Whatever the destination, I’m not a big fan of the Ritchey design. The seatpost junction design is very elegant and strong, but the downtube clamp is fairly crude. Not something I’d trust to endure longterm hard use. A (relatively) cheap alternative is to pick the steel frame of your choice (Soma, Surly, etc), and have S&S couplers installed. Final price is competitive with the steel Breakaway, and the result is far stronger. And you can pick among far more frame designs. Also, many full suspension bikes can be packed into the same cases that a Breakaway uses if you pull the rear swingarm. I’ve done this w/ Intense and Turner bikes many times. A good option for international MTB travel. Carbon is not a good idea considering how these cases need to be packed.